What Mallory has to say about books. Source: I received this book from the author in exchange for an honest review. Thank you, J.K.! Water. It covers almost three-quarters of the planet, comprises more than half the human body, and has become the most coveted resource on Earth. Amaya de los Santos survived the typhoon that left her an orphan. Now she scrapes by as an ice poacher, illegally harvesting fresh water for an always-thirsty market. But when she rescues an injured enemy soldier, she’s pulled into a storm of events more dangerous than any iceberg. After years of relying only on herself, she must learn to trust another…or risk losing all that’s left of her family. Logan Arundson should be dead. After a mysterious attack destroys his military unit, he abandons his Arctic post for his native California, where droughts have made water a religion and a resource worth killing for. But when the water wars follow him home, he must face his frozen demons if he wants to save his town…and the girl he loves. Paul Hayes is heir to an empire. But being vice president of a powerful hydrology company isn’t all gardens and swimming pools: he deals with ice poachers, water rights, and the crushing expectations of his CEO mother. His investigation into company sabotage and the miraculous appearance of a lake in a small California town lead him to a shocking discovery…and an impossible decision. 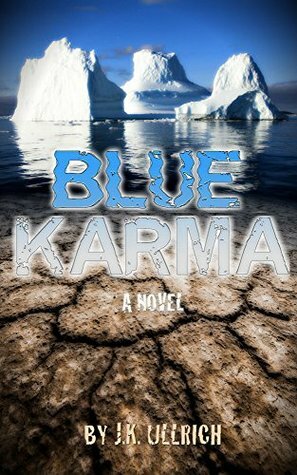 Blue Karma is a story of choices and consequences, humanity and love. In the dystopia that Blue Karma takes place in, water is scarce. The government rations it, people fight over it, and some even use illegal means to get it. (The black market is called the “blue market.” Yup, I chuckled.) Climate change and environmental disasters have displaced thousands of people, too, and those who have had to find new places to live are called environmental refugees, “engees” for short. Engees are hated for taking up space and “stealing” water that “belongs” to others. It’s a tough life for everyone who isn’t swimming in wealth. Blue Karma follows the journeys of three characters who fall at different places of the spectrum. Amaya, Logan, and Paul take turns narrating the story, though Amaya and Logan get more chapters than Paul. The three of them really grow throughout the course of the book, and by the end I loved them all, versus in the beginning I wasn’t immediately drawn to them. They all made rash or stupid decisions at various points, but they learned from their mistakes and experiences. Amaya was my favorite character, but I also loved Logan. I came to like Paul, too, but I never felt as sympathetic to him because, as the vice president of Nilak Hydrology (and the son of its president), he never had to experience the struggle of simply surviving from day to day like Amaya and Logan did. Paul could take baths and go swimming; water for him was in abundance, while the other two characters had to fight for enough of it to sustain them for even a week. Automatically, Amaya and Logan are more relatable characters, although Paul’s eyes and mind are opened to their side of life as he becomes entwined in their story-lines. The disputes over the small fresh water lake on Logan’s family’s farm were honestly pretty scary. It’s insane how far people will go to claim/protect what they believe is theirs — like the so-called “puddle” at least four parties want. The tension and the threat of violence in these arguments and fights made me really uneasy, and I find that well-executed scenes like these make a vastly bigger impact than the blood, gore, and violence we find in abundance nowadays, in all forms of storytelling. Props to J. K. Ullrich for keeping me on the edge of my seat, worried sick for the safety of the main characters. On Paul’s side of things, I actually thought the political complications between countries over land borders and other matters was really interesting. (I’m just a sucker for good political stories, honestly.) I kind of wish there’d been more political gameplay and backstabbing that Paul had witnessed or been a part of, although it made sense for the story (leading up to the climax) to have him lacking in knowledge and involvement. You might have noticed that there is one girl and two guys… Not to fear, there is no love triangle here! There is some romance, but it is not the focus at all. It’s sweet, it’s realistic, and I like how Amaya was never dependent on the guys. She did her own stuff and wasn’t afraid to go off to deal with her own problems. The book has a real plot, and that’s the focus. You won’t find any lovey-dovey stuff here, which is a good thing: Blue Karma balances the romantic relationship perfectly with the overall plot and other character developments. The story’s pacing is great, too, constantly engaging and with new challenges for the characters to face that all make sense and lead up to the climax nicely. What’s also awesome is that I could never predict where the book was going. Nothing felt completely out of the blue, either. I also really liked the ending, and how everything was wrapped-up. Have you read Blue Kama? If you haven’t, would you be interested to? Have you read any cli-fi books before? What was the last book about, or the lack of, water? Comment below letting me know! And, as always, happy reading! Follow me @ toweroftomes on Twitter | Instagram | Goodreads | and Bloglovin’! Thanks, Emma! You’re the one who brought this book to my attention, and I’m so glad I enjoyed it, too! Hooray hooray! I’d love to read this one! I remember a dystopic book about the lack of water too by Mindy McGinnis I think? The title was NOT A DROP TO DRINK. Have you read that one? I always look forward to dystopias like this because I think having NO WATER at all would put humankind to a frenzy, especially since it is such a fundamental and universal need. It’s one of those things ABSOLUTELY needed in order to survive. Hello there! My name is Mallory! I'm a proud book nerd and a gal who really digs her local library. I read mostly YA, but also middle grade, new adult, adult, and even nonfiction. My favorite genre is fantasy and I love all things dragons. I'm a Hufflepuff and a Libra, and I am terrible at chess but awesome at Catan. ♥ ♥ ♥ ♥ ♥ Loved! New fave! Highly recommend! ♥ ♥ ♥ ♥ Really enjoyed! Def recommend! ♥ ♥ ♥ Okay. Disappointing in some aspects. ♥ ♥ Disliked. Quite disappointing. ♥ Strongly disliked. Want my time back. The books reviewed on The Leaning Tower of Tomes are either purchased by me, borrowed from the library, or provided from the author/publisher for free in exchange for an honest review. I never receive monetary compensation for my honest opinions. Each review has a (Source:) which states how the copy was provided. Copyright © Mallory M., 2014-2017, The Leaning Tower of Tomes. All rights reserved. Please respect my original content.